Note: Tanajuras have pincers, which we removed prior to this photo, obviously. The rains have come. The adults sigh a breath of relief as the fields start to green again. Women sweep cupim wings out of house every morning. The kids scramble for their plastic PET bottles and go racing for the yard, eager to catch a few tanajuras for themselves. 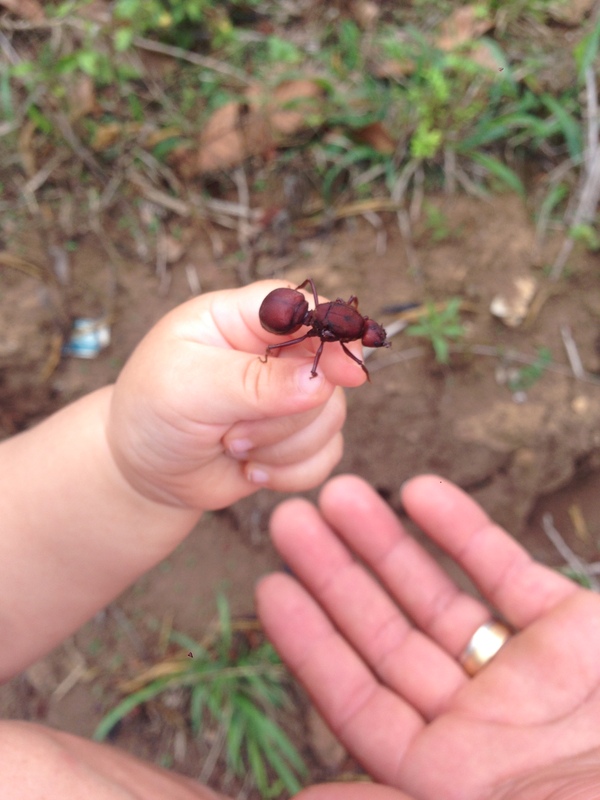 Tanajuras—huge, edible ants—sell for R$20/plate (~4cups) in the market this time of year. Sellers have buckets of the awkward insects for sale. The harvest is brief—approximately two weeks—and cyclical. They emerge from the ground to mate seven times a year, usually after heavy rains. Only the females are eaten. Their tail ends are separated from their thoraxes, roasted, and either popped in your mouth like popcorn or ground to a cornmeal consistency and sprinkled on food. People here are crazy about them. My husband bailed on a conversation with me mid-sentence to get some. A plate of just the tail ends can easily retail for R$50. Three years ago when I first arrived in Brazil I was honored with a spoonful of tanajura flour. It’s nutty-tasting, like cornmeal crossed with peanuts, and dense. You can feel the rich proteins and amino acids in every bite. I like it. Although I’m not sure I could eat a lot of the stuff, it’s so rich. I still can’t bring myself to munch on the insects straight. It’s hard for me to forget what I’m eating. Nevermind that I’m from a state that prides itself on its delicious sea insects; this is different, don’t ask me how. I’m sure that in no time my daughter will be chasing them with Anesio and popping them in her mouth with her dad. Mom’s happy to just watch and take photos, thankyouverymuch. What about you? Would you snack on an ant? My name is Ashlee. I’m co-founder of The Youshare Project, with the mission to connect people around the world through stories. I recently stumbled across your blog and read the above post entitled “Tanajura Time.” I thought it was a really cool story and interesting insight into a place where I’ve never been privileged to travel. I think it would make a wonderful youshare, because it offers a personal, slice-of-life look at farm life in Brazil. If this sounds interesting to you, I would love to email you directly with more information and formally invite you to share your story with the project. You have my email address and website (although please note the site is still under development). I hope to hear from you soon. What a lovely invite! I’m honored! I’ve sent you a personal email. Let’s talk.